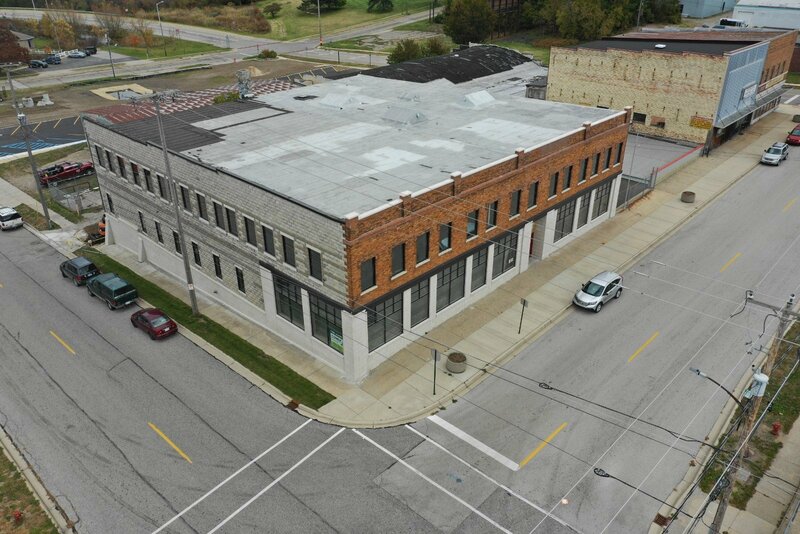 An incoming three-story commercial hub boasting restaurants, a brewery, a coffee shop, and more is breathing new life into a nearly century-old building and is set to further transform a rapidly growing downtown Muskegon. The expansive 21,000-square-foot building at 794 Pine St., formerly the home of Al Perri Furniture, is currently undergoing extensive historic renovation work and is expected to debut as three levels of dining, drinking and office space by late spring or early summer. 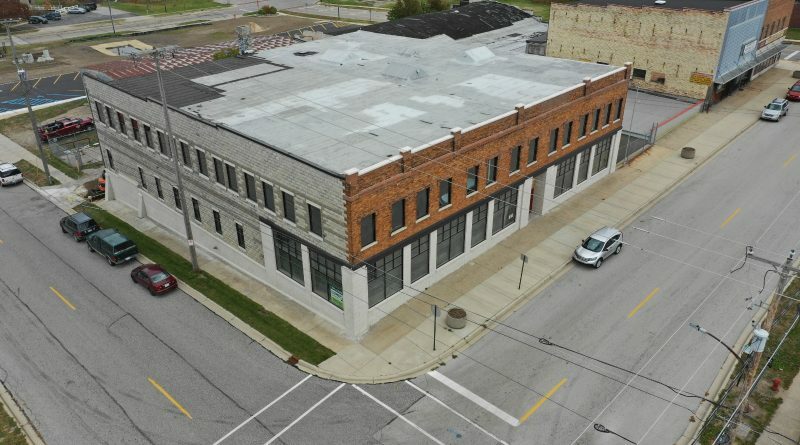 Owned by Muskegon businessman John Essex, the NorthTown 794 development will feature Redmon’s Kitchen & Bar, a sports bar that will offer gourmet burgers, chicken and waffles, vegan dishes, and more; Aldea Coffee; Capone’s Speakeasy and Pizzeria, which will specialize in Chicago-style deep dish pizza, cocktails, and more; Rake Beer Project; a garden-level outdoors courtyard with seating; a rentable 1,500-square-foot conference room; and office space. Rake Beer Project is inking a letter of intent with Essex this week, and he said the head brew master has “a ton of experience at another Michigan brewery operation.” Currently, everything but 6,000 square feet of office space has been leased; Core Realty’s Troy Wasserman and Bryan Bench are overseeing leasing for the building. The main parking for the development will be located to the east of the building in a lot that runs between Clay and Webster. The main floor will house Aldea Coffee, the two restaurants, and the rentable conference room. The brewery and courtyard seating will be located on the garden level, and office space will be situated on the third floor. This whirlwind of development translates not only to a place to eat, drink and work but to an economic engine that will further propel the growth of the city’s downtown, particularly on its northern side, Essex said. Plus, the owner is thrilled that his team is conducting a historic renovation on the building that returns much of it to its original self. “It had sat there empty after Al Perri Furniture shut down in 2006, and beneath that stucco and metal that was there was really cool architecture,” Essex said of the building that was built in 1923 and has been home to a Goodwill retail store in the 1940s and 50s and Al Perri Furniture beginning in the mid-1960s. Vanderlinde Furniture too operated at the corner of Clay Avenue and Pine Street, where the NorthTown development is located, more than 100 years ago. “When I bought it about three and a half years ago, I said, ‘We’ll take the risk and see if we can’t make sense of it,’” Essex said. As part of the renovation, Essex’s team has been able to restore the building’s historic brick walls and tin ceiling. This focus on historic renovation drew Jim Noel, who owns Capone’s and co-owns Redmon’s with Gary Redmon, to the project. 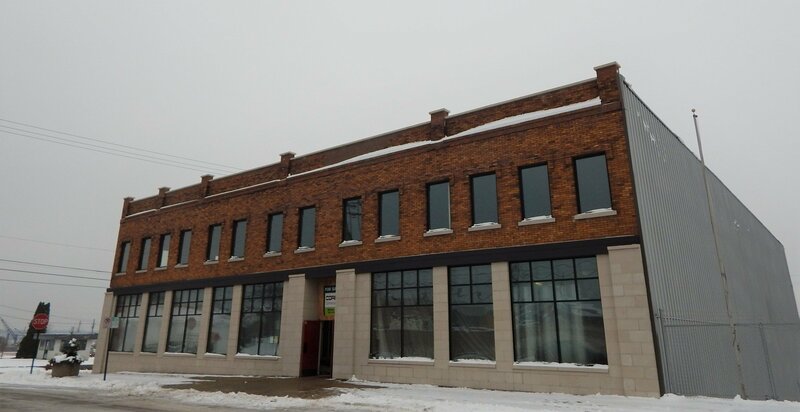 Noel, who also owns Topshelf Pizza & Pub on Apple Avenue and Topshelf Liquor Bar & Pizza in downtown Muskegon, said the tin ceilings will give Capone’s a true speakeasy feel. “We’re excited to be bringing a different selection of food to the downtown,” he said. 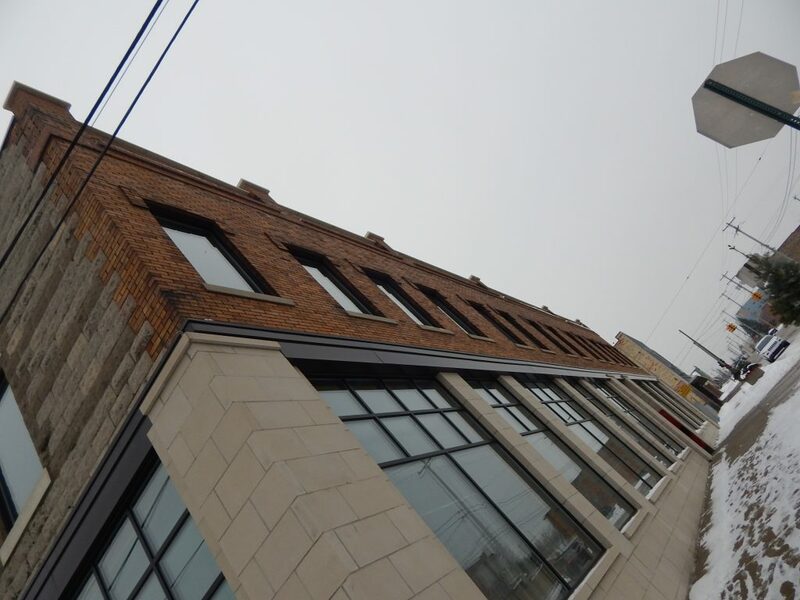 NorthTown 794 joins a growing roster of businesses on the downtown’s north side, including The Cheese Lady, Morat’s Bakery, The Front Porch, East of Eden Wellness Spa Center, and the incoming Nipote’s Italian Kitchen. The project is emblematic of encouraging community support for downtown development and a positive relationship between the city and the business world, Essex noted. 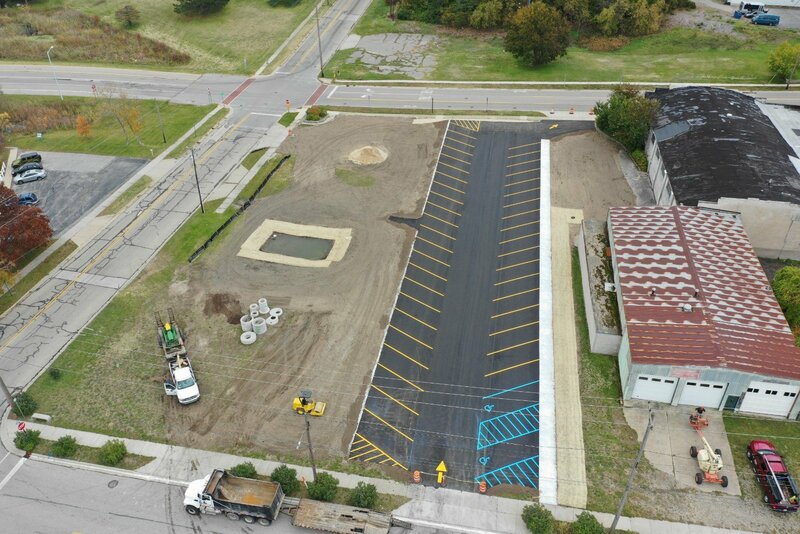 “The city has been very cooperative with developers and business; everybody is working hand-in-hand” to grow a downtown that, not long ago, sat as a series of empty, unpaved roads after the Muskegon Mall was torn down in 2001, Essex said. “Right now, we may not see a lot of financial gain, but that’s not the main driver; we’re more concerned about how we develop our central downtown,” Essex said of the group of local developers working to transform the area. After some $200 million has been invested in the downtown since the mall’s closure, and with more than $1 billion in development projects underway in Muskegon County, the city’s landscape is dramatically different than just years ago. Numerous residential and commercial projects, both completed and ongoing, have translated to a downtown that’s becoming a thriving hub of restaurants, shops, and apartments for everyone from college students to senior citizens. The incoming $17 million convention center and renovated and rebranded Holiday Inn Muskegon Harbor, which will become a Delta by Marriott, will further reshape the downtown—and city as a whole. Now is the time to tear down that disgusting building that seems to only get worse, Czgree’s (?) not sure of the name. It needs to disappear. WOW, finally my little town is growing up, down and all around. It is so exciting to be here during the third redevelopment of the marsh at the rivers end as the Native people called it. Thanks to all who care enough to put their money where my heart calls home. Article left out David Manley of Core Realty who helped make the Noel/Essex connection happen. Just wanted to share some details. Thanks for the great write up. Yeah this is going to be great! Just such a positive spin on Muskegon. Keep growing!